Saint Alexander Nevsky Cathedral is Bulgarian Orthodox cathedral rising at the city center of the capital Sofia. Its gold plated-domes can be seen from afar. Inside the temple is decorated with colorful marble from Italy, Brazil and Morocco. 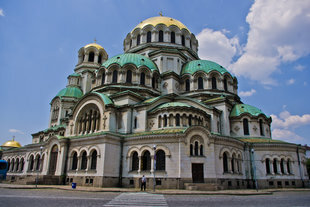 The monument is a cathedral of the Bulgarian Patriarch and symbol of Sofia. Its imposing cross-domed basilica with multiple domes rises over a central city square St. Alexander Nevsky. The bell tower of the church with the cross is 53 m high. There are 12 bells at the temple. The cathedral is near to many other Sofia landmarks such as the President Hall, the National Assembly Hall, the old church St. Sofia, the Archaeological museum and it is only 10 minutes walking distance from BEST WESTERN PLUS Bristol Hotel.